Unabridged Audiobook, 8 hrs, 8 min. Yeah, I was underwhelmed by NYPD Red, but thought that maybe this series would pick up a little, with everything established in the first. Wow, was I wrong. This is basically a Dexter retelling — murderers who got off thanks to good lawyers, bad prosecutors, etc being kidnapped, tortured and killed. Before they’re killed, they record a video confession to their crimes, which is uploaded to YouTube shortly after their body is discovered. Of course, one of the victims is the campaign manager for a mayoral candidate, and the body is discovered 8 days before the election — making the whole investigation a political issue in addition to a pressing crime. 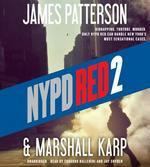 Given the prestige and notoriety of the latest victim, the case is bumped up to the NYPD Red team. From there, it’s pretty much a paint-by-numbers affair — I called the whole thing, even the twists, early on. There’s so little to commend in this book that I can’t think of a positive way to finish this sentence. I guess I understand why you’d have two narrators for the audiobook — one for the first person detective narration, one for the other perspectives. But I think we’re all smart enough to follow things with just one voice. Both narrators did a decent job, but nothing remarkable. They probably did the best they could with the flat prose and dull dialogue. Dull, predictable plot with personal side-stories that made me like everyone less. Both authors are capable of such more — I don’t know why they aren’t delivering with this series.